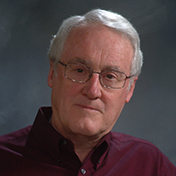 John Collier’s research primarily addressed the question of how bacterial toxins cause the symptoms of disease. He and his group studied protein toxins that are responsible for major symptoms produced by many bacterial pathogens, such as the causative agents of anthrax, diphtheria, botulism, tetanus, and other diseases. Some of these toxins have the remarkable property of being able to cross biological membranes and penetrate to the cytosol of mammalian cells. There they alter the cellular metabolic machinery in a way that protects the invading bacteria from the host’s immune system, but also causes potentially lethal effects on tissues beyond the immune system. Early in his career Dr Collier performed experiments demonstrating that diphtheria toxin acted directly on protein synthesis machinery within the cell, representing the first instance in which a toxin was shown to cross a membrane and modify a cytosolic target. He then spent many years describing the structure and activity of the diphtheria toxin. In recent years his group studied anthrax toxin intensively, with a view to understanding how a component of the toxin that forms pores in membranes transports the other, enzymatic components of the toxin to the interior of cells. They found that the pore-forming component serves as an active transporter, as opposed to a passive entity, and gained a detailed understanding of the structure of the pore and how it functions. Besides yielding an understanding of how bacterial pathogens damage infected individuals, their work has had ramifications with respect to the use of toxins to develop targeted therapeutics for treatment of cancer. After receiving his BA from Rice University in 1959, Dr Collier entered graduate school in biology at Harvard, where he performed doctoral research on the mode of action of diphtheria toxin under AM Pappenheimer, Jr, receiving his PhD in 1964. Following two years as a postdoctoral fellow in the Molecular Biology Institute at the University of Geneva, he joined the Bacteriology Department (later renamed Microbiology) at UCLA and advanced through the ranks to Professor in 1974. In 1984 he moved to Harvard Medical School as Professor in Microbiology and Molecular Genetics and was later appointed Maude and Lillian Presley Professor. He served for six years as Faculty Dean for Graduate Education and Chairman of the Division of Medical Sciences and was interim chair of his Department for a short period following the death of Bernard Fields. He became Professor Emeritus in 2013.